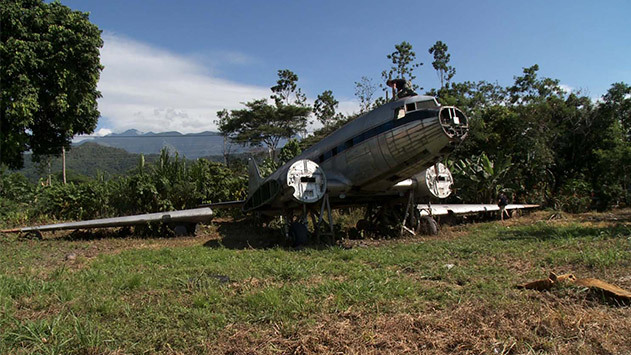 In this DAKOTA HUNTER Blog you will find a series of amazing photos of Caribbean Drugs Runner aircraft that were left abandoned, crashed, seized or wrecked. From the earliest start of the illicit drugs trade from Central/ South America to the USA, aircraft played an important role in the transport. One of the first to exploit aircraft on a larger scale for such trade was Carlos Lehder, a car thief, marijuana dealer, and smuggler from Medellin, Colombia. The tale of the modern day “Pirates of the Caribbean” is described in this Blog. First time I came to the Bahamas was in the early 1990’s and found the remnants of that collateral damage all over the Caribbean. 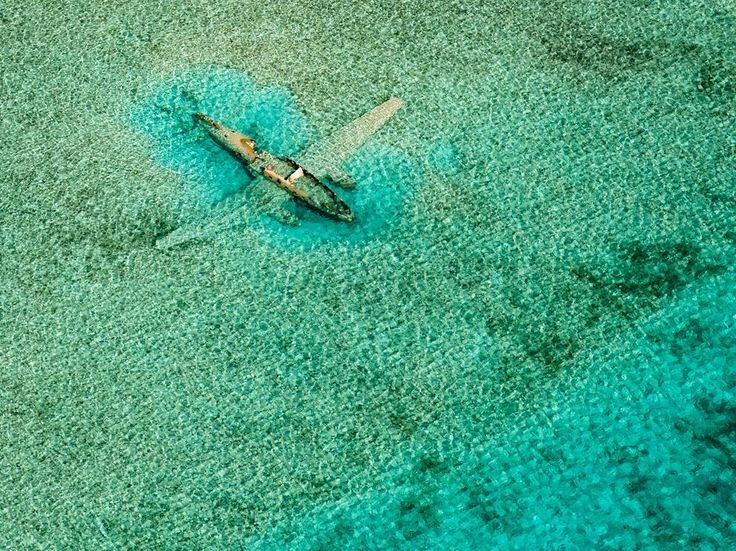 Wrecked, abandoned and crashed aircraft, littered over the lagoons and beaches, those were fertile hunting grounds for the Dakota Hunter, in search of the legendary DC-3 (and its parts) at the last frontiers. Take a look at this collection of photos in this blog , it will give you some idea of the what happened out there in the wild years. Photo above was taken in Bimini in 1995 or so. 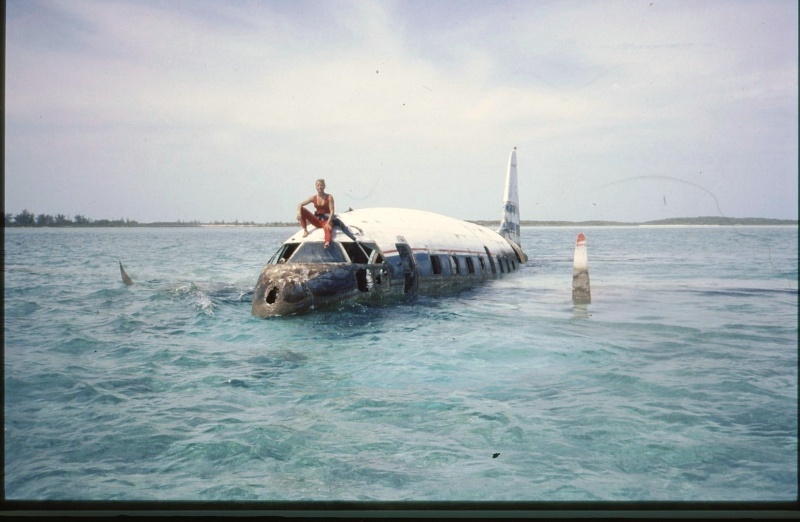 I stand here on top of a crashed Curtiss Commando C-46 that lays there since years, upside down in the shallow lagoon south of Bimini Island. According to local gossip, this aircraft tried to land on the tiny airstrip just next to the beach, with the idea to deliver the drugs at night to Go-Fast type Fishing boats. With 3 or 4 hefty 200 HP outboards lined up on their sterns, the “Sport-Fishing Boats “, hired in day-time for the Marlin Hunt, were waiting in the heat of the night to take over the stuff from the Colombian aircraft and cross the 50 miles distance between Florida and Bimini. Way back in the 1930’s, the lovely Island of Bimini was heavily involved in the smuggling of Alcohol. The Drugs followed in the 1970’s and beyond. For some of the 600 residents, there was rarely a dull day while also the nights must have been exciting for the hardworking fishermen. Bimini, a once-sleepy fishing resort in the Bahamas (that is what the tourist folders say), it has now morphed into a Mecca for gamblers. But that is legal Gambling, I presume. 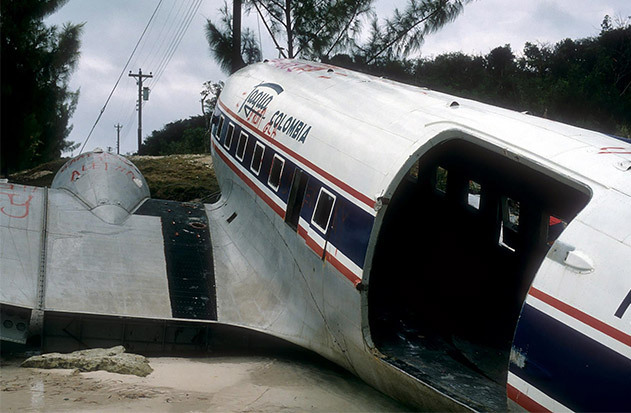 Photo above and the feature photo of this Blog depict both the crashed Colombian DC-3 HK-1505 on a Caribbean Island’s beach. The aircraft used to be a decent Passenger/ Cargo hauler from Villavicencio/ Colombia, flying since some years in this Tagua livery. But one day, or better one night, she was spotted flying at very low altitude over the Caribbean sea from Northern Colombia to the Bahamas. The most probable scenario is that she was detected by an overhead flying US Patrol aircraft, like the P-3 Orion. That aircraft with an AWACS-like antenna dish on top of its fuselage had picked up the Dakota on her down looking radar or heat-detecting infrared camera. What happened often is that the pilots of the suspect plane were summoned to land on a major airport for a checkout. 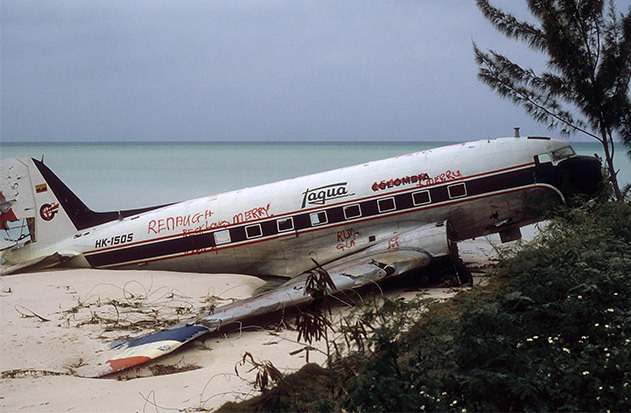 The pilots of this Tagua DC-3, like many other pilots of drug smuggling aircraft, opted instead to land in nearby shallow waters or on a beach, trying to escape their apprehension. Photo above is the same Tagua DC-3 , with a very empty cargo hold. Wonder what happened with that cargo? Were the US Coast Guard/ DEA/ Local agents or maybe the locals the first to arrive on this little Gold Mine? 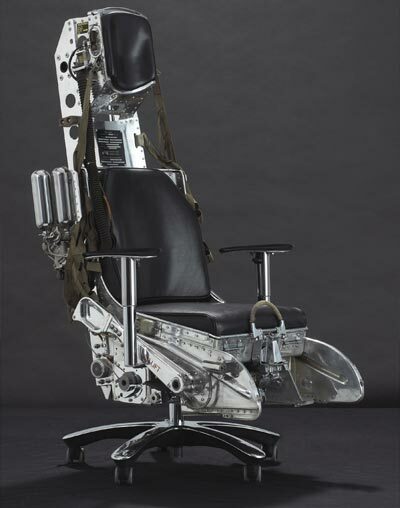 Engines were later taken off, always the most valuable part of a crashed Vintage aircraft that was built in WWII . According to my friend Michael Prophet, there is something weird in the way this aircraft was declared WFU or “Withdrawn from Use” at Villavicencio. That is what the “DC-3 Bible”, aka Air Britain 2006 publication says about this aircraft! Very unlikely indeed. As I found out during my expeditions to the Amazon and Venezuela, it was not uncommon that certain DC-3s vanished, or were seized and ‘scrapped’ or declared WFU, while that very same aircraft a year later or so popped up with a new livery, registration number, and a different Manufacturer’s Plate/ Tag and Factory serial number riveted inside the cockpit. This “transforming” of airframes could well have been practiced in the drugs hauling circuit for obvious reasons to deceive the authorities. Worse, there were original/ legal owners, who lost aircraft in confiscations by the judicial authorities, accused of Drugs Trafficking. With no trials, the “distressed” aircraft vanished out of sight for a year, only to relive with a new ID, now in hands of the same authorities that had seized the aircraft some years earlier. It is an Amazing World out there, I can tell you from my long time experiences and dealings that I did there during my expeditions to find the planes and the parts. Photo above shows the decaying wreck of a Curtiss Commando C-46, most probably the aircraft located near Norman’s Cay. It is a snorkel divers paradise by now in the crystal clear shallow waters of the Bahamas. Photo made of what seems the same aircraft Curtiss Commando C-46. Taken some years earlier. 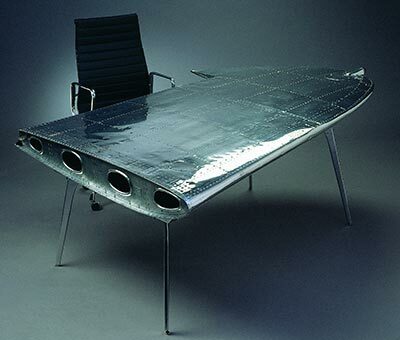 Clearly in a more pleasurable condition, not only the lady but also the plane . 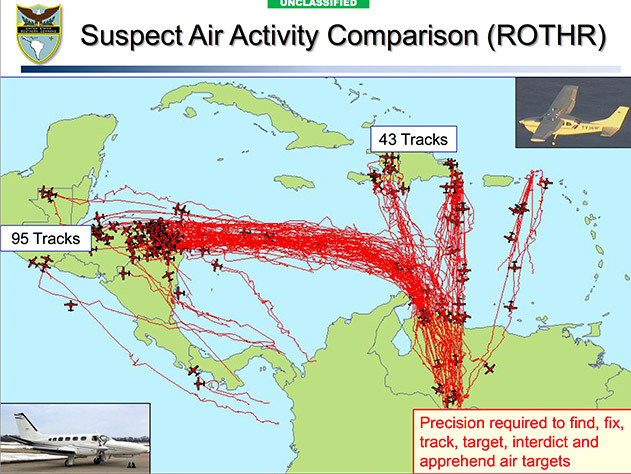 Photo above depicts a more recent mapping of drugs flights. With the demise of the flights from Colombia to the Bahamas due to a very strict airspace control and more grip on the airstrips in Northern Colombia, we see on this map the new approach of the Drugs Lords. The start of most drug flights has been relocated very clearly to Western Venezuela, close to the river Orinoco making the border between both countries. The river port Puerto Ayacucho is since years one of the drug smuggling hubs, that were used also by FARC in its heydays for the smuggling of weapons and drugs. It was a No-Go area for me when I visited Colombia again in 2006 and many times after. Allegedly, even the legendary Presidente Hugo Chavez and his shadowy successor, President Maduro were/are involved in that trade. (My book discloses a lot more details of that FARC – Chavez link, a combo that ruled the South American Drugs Trade for years). Venezuela is a country in turmoil, with a serious power vacuum, and isolated from International Drugs fighting organizations as DEA etc. That is all fertile ground for Drugs smugglers who can easily bribe the authorities, being part of a Government that can barely pay the salaries of their agents and officials. Drugs from Colombia (likely, Venezuela produces now lots of home made drugs) are transported over that Jungle border river into Venezuela and flown mostly to Honduras, Dominican Republic and Haiti with all sorts of smaller aircraft. From there, it is another hurdle to get the stuff into the USA, but the Worlds largest Drugs Market is luring and makes the smugglers every time more inventive. 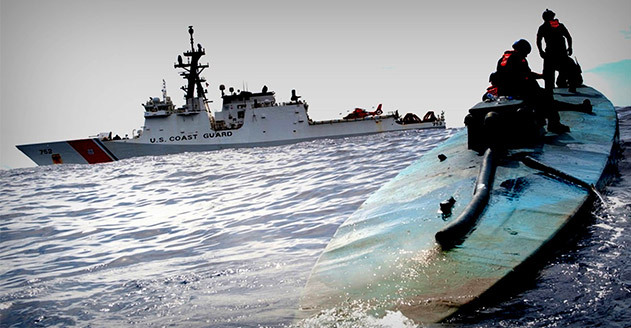 Read how they manage to find new loopholes in a never ending struggle to stop the drugs trafficking into the USA. Photo shows a Swearingen C-26 twin turboprop, dressed in black. Be it with Shark Teeth under its nose and a huge radome under its tail. With antennas all over, this is not a normal plane, but a very hefty spy plane that is involved in the modern aerial warfare against drugs smugglers hauling their trade in aircraft, Go fasts, fishing boats or submarines. This plane flies about 240 knots in top speed but more important. it has a superb endurance that gives a loiter time for hours. 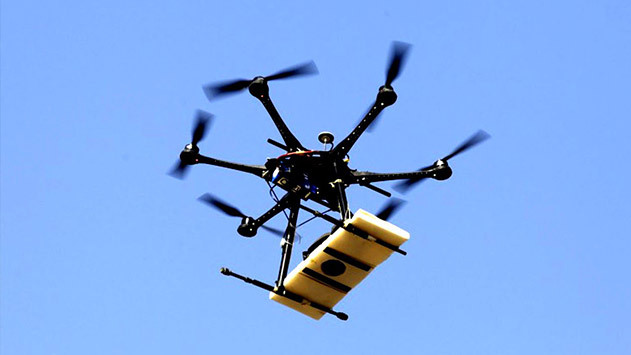 With infrared cameras, she can pick up running engines from miles away, be it airborne, on the water or under water. Photo above: With the intensified border patrols, walls and electric fences, there came the tunnels and later the airborne crossing of the Mexican-US border by Ultra Light aircraft at night. The drugs are slung underneath the aircraft in racks that can be dropped without a landing, in a zone where the pick-up will be arranged, just over the border. 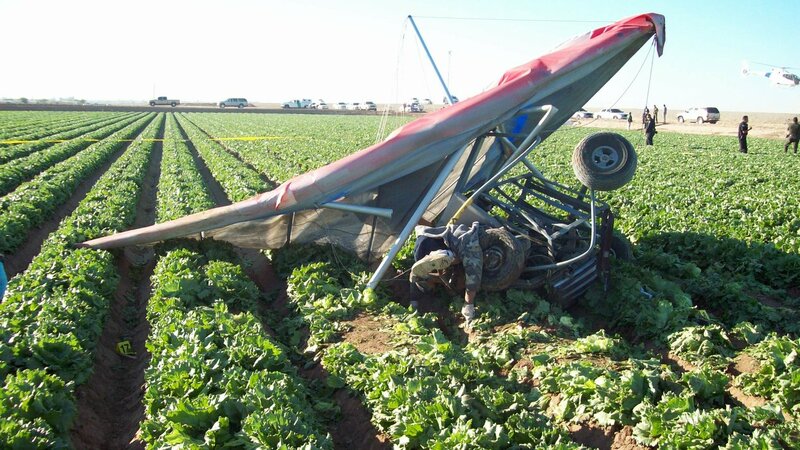 This particular Ultralight made a fatal crash landing in an Arizona field. Obviously, the poor night visibility had hidden the gutters in the field and the flight ended badly for the pilot. Photo above shows The Dakota Hunter crawling out of the cockpit roof hatch of this seized DC-3 in Villavicencio. My lifetime passion for his aircraft has its roots in my kid years which I spent in the Borneo Jungle between 1950-1957. The Dakota became my Hero after a near fatal accident that I had as a 5-year-old boy. 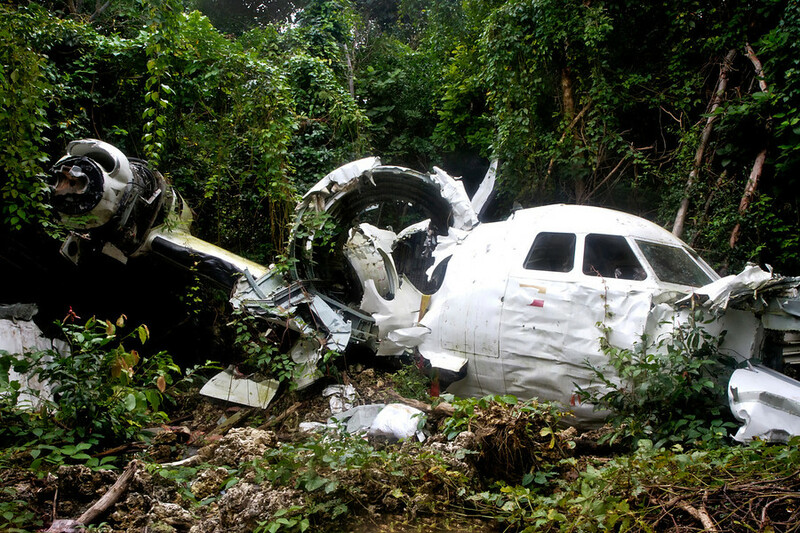 The plane flew me as an aero-ambulance into a hospital 300 miles away from that Jungle post. The love never faded away, only became stronger and in the early 1990’s I felt a strong urge to meet that plane again. That burning passion brought me all over the Globe, in search of that DC-3 on the last frontiers. Alaska, the Yukon, Honduras, Thailand, Madagascar , the Caribbean, the High Andes, Venezuela and finally, the Colombian Amazon: that is where I came closest to what I was looking for. The 20+ expeditions that I made, they could not bring back my eventful Jungle Paradise youth from Borneo, but I came close, very close. 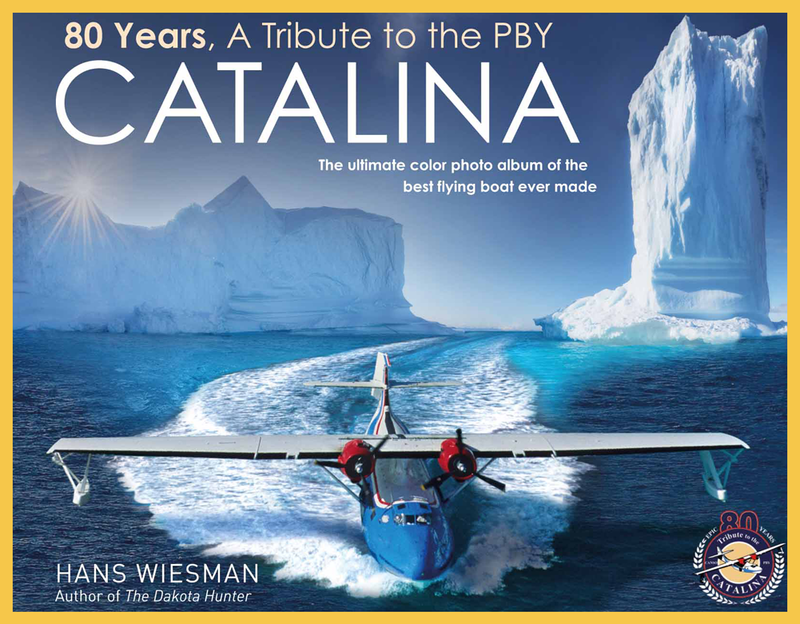 With all my adventures and encounters with the planes, pilots, the remote communities, the Military and the War/ Drugs Lords, I have collected my stories in a book of 320 pages, engagingly written and illustrated with 250 unique photos, of which you see a small number in this Blog. 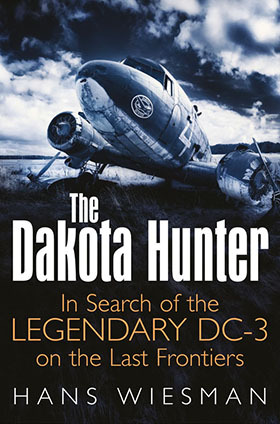 The book is titled The Dakota Hunter and describes my search of the abandoned, crashed or still flying Dc-3/ C-47, in remote places where the last of the WW II built aircraft still struggle for survival. Come with me to see the wrecks and crashed aircraft that I visited for recovering the intact parts, and always with that indomitable curiosity and the questions that I ask since my youth years in Borneo “… and what happened here?”. It means diving into the history of the final and often fatal flight of the wrecks I ran into. For ordering this book, you can go directly to the Amazon page by clicking here at Ordering at Amazon The Dakota Hunter Book. For 5-star reviews of my book The Dakota Hunter, scroll down on that Amazon page. For Previews and my earlier Dakota Hunter Blogs , click here at dc3dakotahunter.com. We will not pass your personal information on to any third parties. With every newsletter, we will give you the opportunity to cancel your subscription. 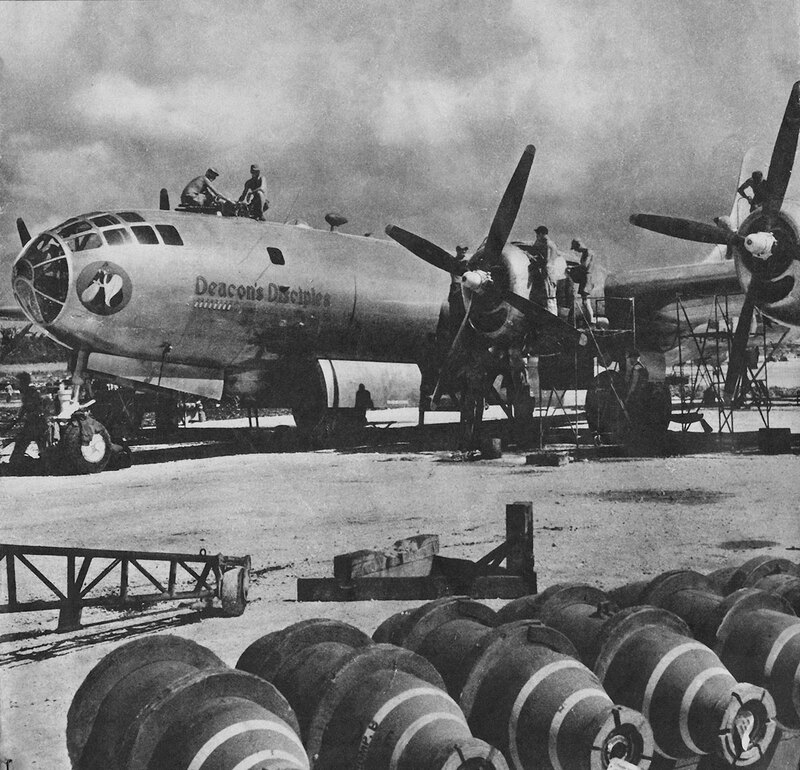 Marianas, that B-29’s fixed aircraft carrier in the Pacific was built 72 years ago.